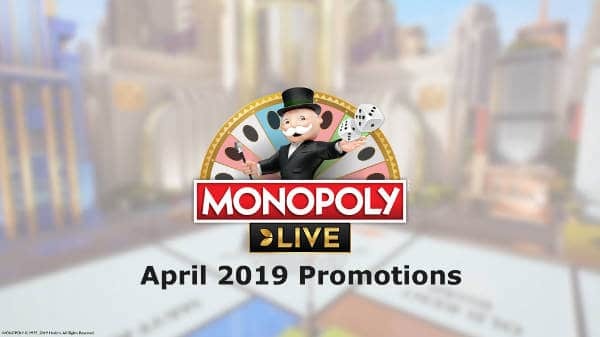 The launch of Monopoly Live has seen a flurry of promotions launched by casinos encouraging us to try out the new game. I’ve been through the best live casinos and found a few offering the Monopoly live promotions. To save you the trouble I’ve listed them all so you can find the best promotional offer. There is a common theme running through them all. Every one requires you to play Monopoly Live to gain tickets to a prize draw or raffle. 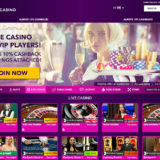 The qualifying stake amounts differ between casinos as do the prizes on offer. Tournament – player with the most game rounds played during the promotional period will top the leader board. From 16:00 CET on Friday 29th March to 23:59 CET on Sunday 7th April 2019. 1st 50 positions get a cash prize. The prize for 1st position is £3,000 Cash. Opt in Required. Only play on Monopoly live qualifies. Min bet 20p. The top 50 players with the highest number of game rounds played will share the prize pool of £10,000 cash. 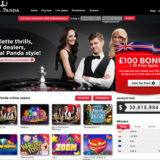 Prize Draws – Win a share of £30,000 in 2 x £15,000 prize draws. 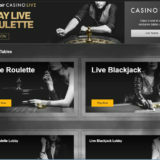 Earn tickets by placing winning bets on the 2 Rolls & 4 Rolls bonus rounds. For Draw 1 – Play between 09:00 on the 1/04 until 22:59 on the 7/04. For Draw 2 – Play between 09:00 on the 8/04 until 22:59 on the 14/04. 1st 50 drawn players get a cash prize in each draw. The top prize for 1st position is £5,000. Opt in Required. Every time a player gets into a bonus round with an active bet on the 2-rolls or 4-rolls betting types, players get one ticket into the weekly raffle for the chance to win a share of £15,000. Two (2) raffles throughout the promotion, prizes paid out on Monday 8/04/19 and 15/04/19. One prize per player per raffle. T&C’s Apply. Weekly Prize Draws with £5000 of cash prizes. 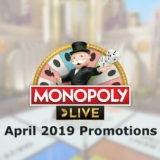 Draw tickets earned through play on Monopoly live. Draw 3 & Grand Draw on the 19/04. Draw 1: 28/03 – 04/04. Draw 2: 04/04 – 11/04. Draw 3: 11/04 – 18/04. Grand Draw 28/03 – 18/04. Draw 1 – Top 20 players, 1st prize £1,500. Draw 2 – Top 20 players, 1st prize £1,500. Draw 3 – Top 20 players, 1st prize £1,500. Grand Draw -Top 50 players, 1st prize £3,000. Plus a £20,000 grand prize draw. Offer ends 22.59 on 18/4/2019. Every £100 wagered across all wheel segments earns 1 ticket to £20K draw. Every £25 wagered on 2 or 4 Rolls earns 1 ticket to £5K draw. T&Cs apply. 18+ www.begambleaware.org. Daily Draws Between Monday 1st April and Sunday 7th April. 1860 Cash Prizes a day. Top prize of £100. 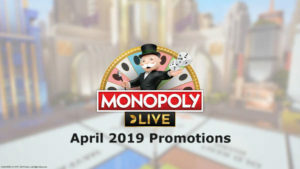 Minimum stake £10 on Monopoly Live to earn 1 entry into the Prize Draw on that day. Every additional £10 cash staked on Monopoly Live = 1 additional entry to Prize Draw on that day. Each daily Prize Draw value £20,000 split by 1,860 prizes. See Prize Draw table for breakdown of the Prizes. Max 1 Cash Prize per customer, per Prize Draw. Offer ends until 07.04.19.